This post has been viewed 4107 times. Another year is ending, quickly coming to a close. For taking me down the paths, You chose. And a lot of times it went uphill. As long as I stayed in Your will. Sometimes, I faltered, as I walked along life's way. To see me through each day. When I was ill, Your healing power came through. Oh, my God, my Father, How I love You. Father please forgive me, of my daily sins. Let me walk bravely, on that rough and uphill road. That's always there to lighten my load. When I'm in doubt, Father, calm my fears. And if I should cry, please kiss away my tears. Is to walk steadfastly, in Your will. Embark on a spiritual journey of finding your life purpose as poet Emily Gaye Boeve shares how she found hers through poems that will tug at your heart. 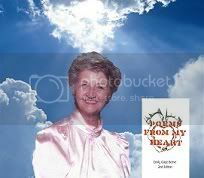 Poems From My Heart: 2nd Edition is a collection of poetry pieces inspired by the Holy Spirit. While some of these poems were written about some of the men the author and her husband have ministered to, and others came from her own life experiences, all pieces are lovingly crafted to bring motivation and comfort to any reader. Free your self from all the sorrows and pains, and move on to a life with your Savior. Be guided by this book today.